← What Happened To My Frets? Videotaped Recitals - Good or a Necessary Evil? Does A Videotaped Music Recital Assist A Student? I remember when I was in high school and had to give a demonstration speech. It was videotaped. 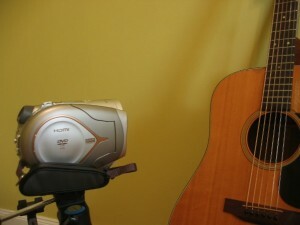 Right from the beginning, I hated the thought of having to demonstrate something in front of both my class and a camera. It made me nervous, just like performing music in front of people may make a performer nervous. The minute someone puts a camera in front of you, that performance takes on a new dimension. 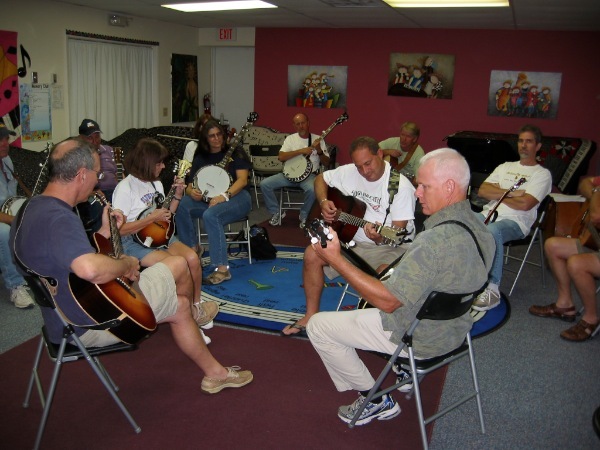 For the first time in years, students from Fretmentor’s weekly bluegrass class in Jupiter, Florida were videotaped in recitals. In the beginning of this 8-week session, groups were selected and one song was chosen randomly out of a hat. The groups had 8 weeks to practice either individually or with the group as a whole. It should be noted that all groups work on approximately 20 songs that are originally arranged by Fretmentor. So students are all working from the same versions and arrangements for each tune. This group has made great strides over the past couple of years. I recall some earlier classes where one of my students advised me that she was sick to her stomach all day, while thinking about performing in front of others later that night. I also had a student who told me that he performed in rodeos throughout his life without any problem but the mere thought of playing music with others, made him nervous. Not only are the latest students performing regularly in front of others, they had the courage enough to allow themselves to be recorded, so they can actually see and listen to the results. As a teacher, you can only think of this is a great learning tool. Fretmentor has its own You Tube channel where the videos can be listed as private, so only those receiving authorization can view their performances. This adds comfort for those who are somewhat apprehensive about being exposed to the public via the internet. I would like to hear from both the students and others about their experiences with having to perform a recital that is videotaped. Was it hard to do? Did it make you nervous or uncomfortable? Do you believe the experience will make you a more confident player while performing in front of your friends or the general public? Did you learn anything from the experience? Please share your experience with us by commenting below. This entry was posted in Banjo, Fiddle, Guitar, Mandolin, Music Technique, Recording & Technology, Uncategorized and tagged fretmentor's bluegrass class, recitals, videotaped performance. Bookmark the permalink. I sort of blocked out the camera…(and everyone else for that matter).I just concentrated on the music and on what my group was doing. For me it wasn’t traumatic at all… However, waching myself afterwards … I didn’t like that….not that we played bad….I just don’t like watching myself performing…..Makes me feel very uncomfortable. I too did not really notice the camera when we got up there. It seemed to go very fast as well once we got started. I don’t want to critique my actual performance too much. I think all the groups did really well especially considering that I don’t think any of us have experience being filmed. It felt like we were in this together and that made it easier. It was a blast! I really enjoyed working with the group, even for the short time it was. I believe all my co-players understood and took seriously the concentration and attention each player needed to apply, and they all did it. What I learned about my own playing was that I tend to rush. Damn it! (If I’ve been doing this for awhile no one ever said anything) I noticed many players in all groups were very nervous, and perhaps we can talk about this in class – if we as players are really listening to the music, we won’t have any room in our brains to even think about worrying whether or not we’re going to screw it up, yes? Thanks for this exercise and I am so happy you’re keeping it going!